Very good location. The lady at reception was very friendly. Rooms are big, well kept and clean. Internet works well. Mattresses are nice and comfortable. Breakfast is simple, but OK. I would definitely stay in this hotel again!. 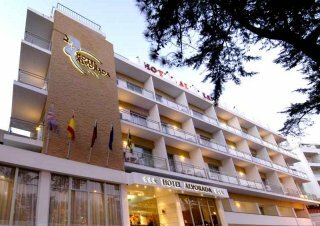 This hotel is located in the tourist centre of Estoril, lying opposite the biggest casino in Europe. The hotel is situated just 150 metres away from the congress centre, making this a great option for business and leisure travellers alike. The hotel is located just a short distance away from an array of shops, restaurants and bars, as well as convenient links to the public transport network. The beach lies just 300 metres away. This wonderful hotel welcomes guests with warm hospitality and excellent service. The guest rooms are beautifully designed, offering a peaceful setting in which to unwind at the end of the day. Guests will be pleased by the host of facilities and services that the hotel has to offer. Bathroom, Shower, Bathtub, Hairdryer, Toiletries, Telephone in the bathroom, Free WiFi, Internet access, Direct dial telephone, Satellite TV, Carpeted floors, Centrally regulated air conditioning, Individually adjustable air conditioning, Central heating, Safe, Balcony, Wake-up service, Desk, Smoke detector, Housekeeping, Soundproof room, Extra beds on demand, Cot on demand. Check in:14:00 hrs. 00:00 hrs. Check out:07:00 hrs. 12:00 hrs. (*) Some services are to be paid directly in the hotel. The photos show an general idea. Installations could be different.